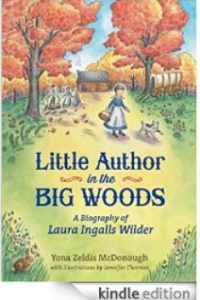 Little Author in the Big Woods: A Biography of Laura Ingalls Wilder , Yona Zeldis McDonough, author and illustrated by Jennifer Thermes was released on September 15, 2014. I just purchased the book for my Kindle about five minutes ago. I will post a review in a few days, but the previews look really good The book description on Amazon speaks of the way young readers identify with and love Laura’s stories, but many of them do not understand the stories are autobiographical accounts of Laura’s pioneer childhood. The intention of this book is to offer a biography about Laura for younger readers which will point out the differences and many similarities between the fictional books and the true stories. I peaked at my download and love parts that inform, but do not talk down to the reader. The author points out that Laura shared her name with the character, Laura Ingalls. Some names are changed — there was an unkind girl, but her last name wasn’t Oleson! Beautifully illustrated with a print layout similar to those in Laura’s Little House books, Little Author in the Big Woods: A Biography of Laura Ingalls Wilder is available for e-readers like my Kindle Fire and in hardcover at your favorite online store. I’m sure your favorite bookstore will be able to get a copy for you. This is not the first book of its type from author Yona Zeldis McDouough. She has several others that are also aimed at the younger reader. I learned about the book pre-release from a post on Twitter about this review from the Nonfiction Detectives . A book like this can deepen the bond that readers have with Laura and the stories of her life. That bond has been the catalyst for several museums and events across the Midwest commemorating Laura and her writing. Because she wrote the books at Rocky Ridge Farm, the museum and well-cared for homes on the farm are a hub for the other locations. It was at the little desk in the farm house at Rocky Ridge Farm where the stories came forth from Laura’s heart to ours. You can be a part of the restoration and preservation going on at Rocky Ridge Farm to provide an experience of a farm in the life and times of the Wilder family. Your gift Today Will Keep Yesterday For Tomorrow. 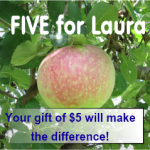 I invite you to join the FIVE for Laura campaign with your gift of $5. You can conveniently make your gift online at the Wilder Home website or you can mail a check or money order to the address on the donation page. If you have issues or questions, please feel free to leave a comment for me here and I will try to help you.